Description: A small to medium evergreen tree of the magnolia family, reaching up to 8m (26ft). The leaves are lanceolate and the axillary flowers are yellow. The fruits are harvested before they ripen, then sun dried. It is, as the name suggests, star shaped, radiating between five and ten pointed boat-shaped sections, about eight on average. These hard sections are seedpods. Tough skinned and rust colored, they measure up to 3cm (1-1/4”) long. Aromatic Scent: Anise Star has a powerful and licorice-like scent. Common Uses: The potent chemical constituents of Star Anise include trans-anethole and safrole, and can cause dermatitis in sensitive individuals. The seeds have traditionally been used in the East in small quantities, as a spice and remedy but also as a carminative, stomachic, stimulant and diuretic for combating colic, indigestion, and rheumatism. Important Note: This essential oil may solidify, and if so, must be heated to be brought back to a liquid state. This attests to the purity of the oil you have purchased. Historical: For centuries, the seeds of Star Anise have been chewed in small quantities after each meal to promote digestion and sweeten the breath. The Japanese plant this tree in their temples and on tombs, and use the pounded bark as incense. Homeopaths prepare tinctures from the seeds. Color: Colorless to pale yellow liquid. 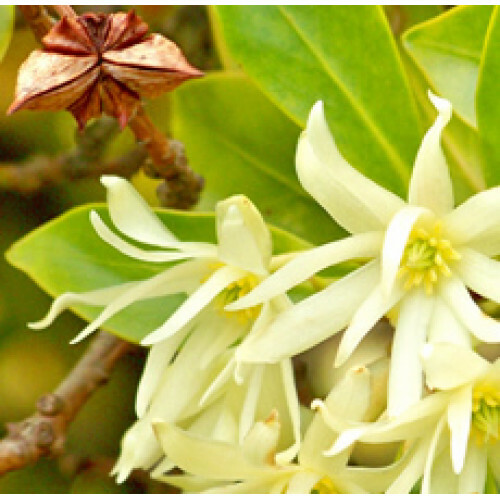 Common Uses: Anise Star Essential Oil has carminative, stomachic, stimulant and diuretic properties. In the East it is used to combat colic and rheumatism. Consistency: Light Note: Top Strength of Aroma: Strong Aromatic Scent: Anise Star has a powerful and licorice-like scent.